Bay Food Brokerage employs a diverse group of professional Retail Representatives that are dedicated to serving our clients through Sales Distribution, Merchandising & Marketing at store level. Let Bay Food Brokerage show you the best way to build your business by utilizing our specially trained representatives. Our experience, innovative processes and customer satisfaction will increase your revenue. Using state of the art technologies and constant store level contact enables our representatives to completely learn your business. It’s important that our representatives become an invaluable part of every manufacturers team in effort to provide the most affordable and efficient service. 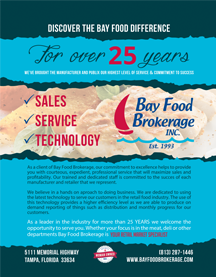 Bay Food Brokerage representatives will work hard to exceed your expectations. 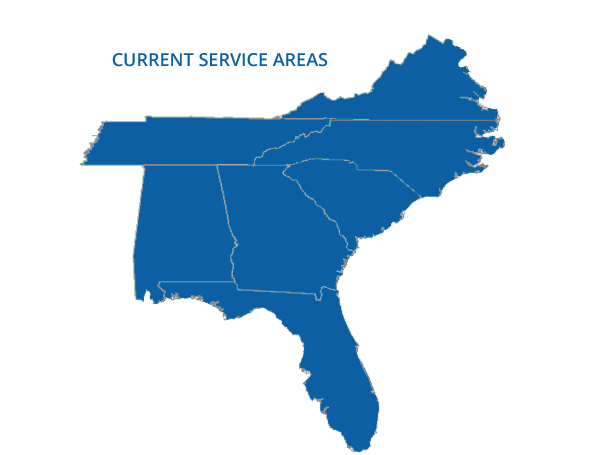 Bay Food Brokerage is continually expanding our market representation throughout the southeastern United States. If you are current client expanding your sales locations or are a potential client located outside of our service areas shown above contact us! We may be in the process of establishing representation in areas not listed. Our sales department will be able to assist you with the most current information about our expansions.